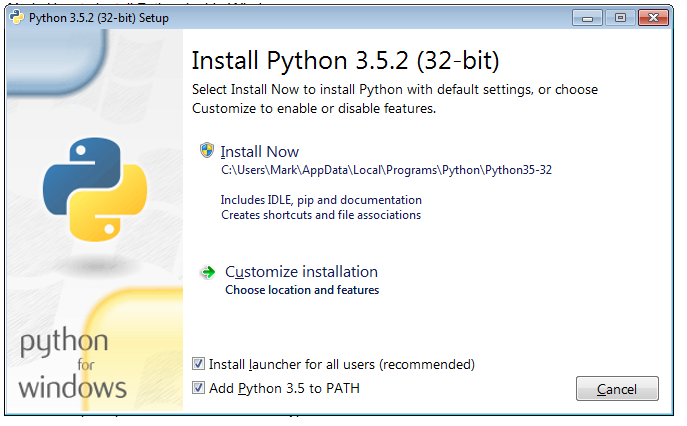 If you are currently using a windows operating system, the follow the steps to install Python on Windows. 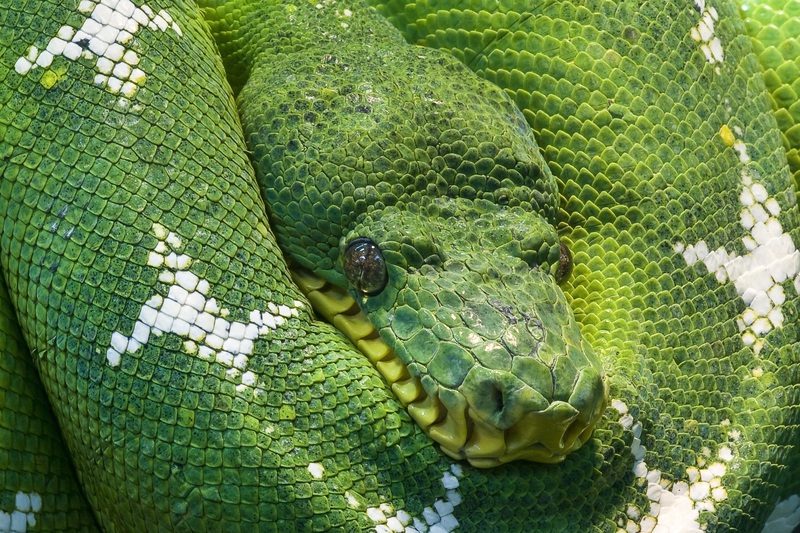 We are going to use version three of python. It is going to get most of the future updates with version 2 only getting bug fixes. At the time of writing version 3.5.2 is the latest. So install it. I always try to install the MSI version. If offered an option to install for all users or just the current user. Install for all users. If given an option to add python exe to the path say yes. This will make your life a lot easier. 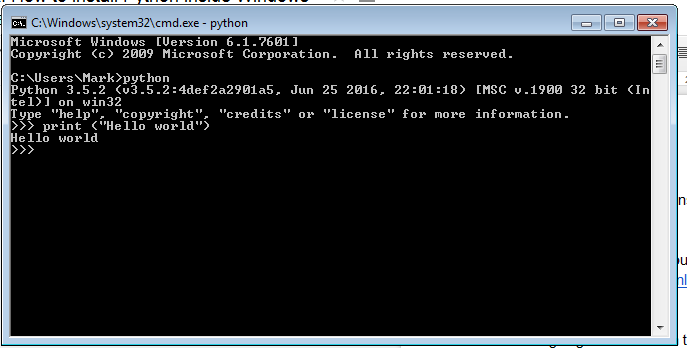 Type in python at the command prompt and look at the output. Make sure it gives the version number you downloaded. I get an error message as well as I success message, but the upgrade works.Pip is the preferred program it use to download python components. But we upgrade because recent versions offers much better performance. We use virtualenv to keep our list of requirements for the different versions of our requirements seperate. We are going to test downloading requirements to make sure everything is set up correctly. Builds the virtualenv. This is just a set of directories that python puts special versions of everything in. This activates your virtualenv meaning with python will use libraries and modules inside of it. 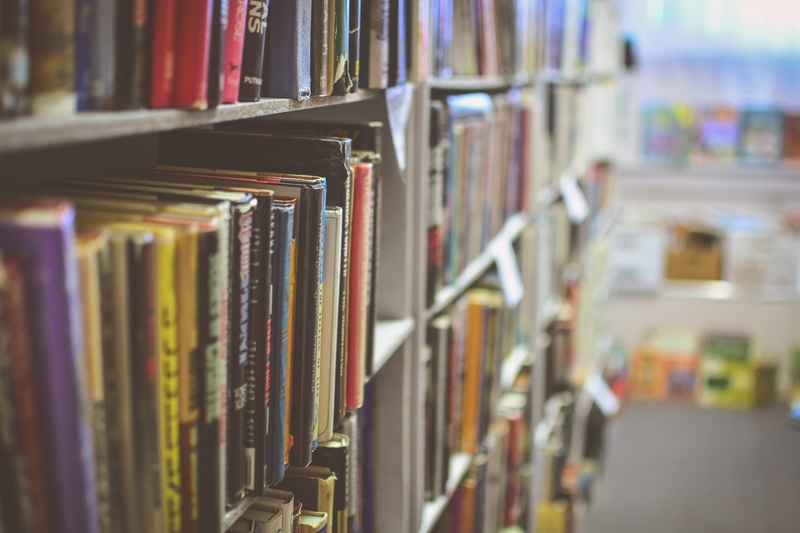 Do a dir to see the list of directories it has created. Once set up we need to activate the virtualenv which means we will use the versions of libraries in it by default. 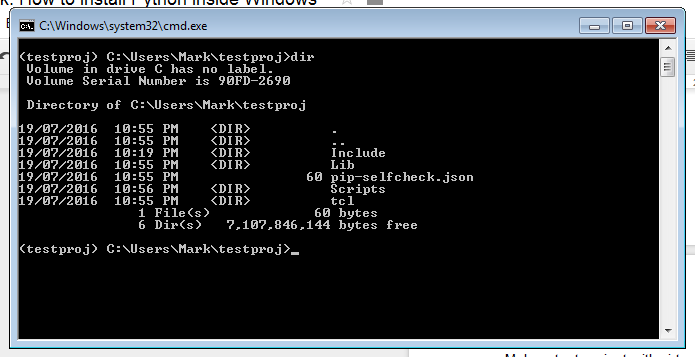 The (testproj) is the name of the virtualenv that we have activated. 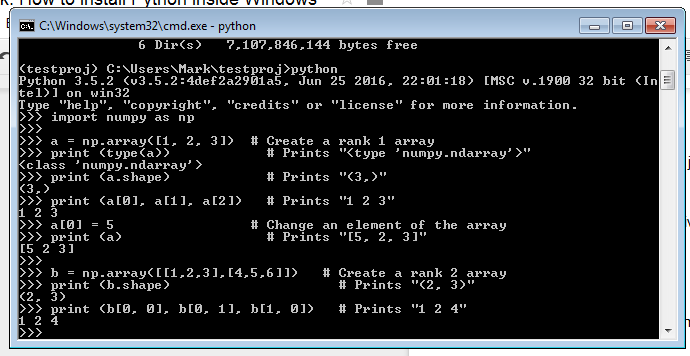 We are going to use an example from numpy to check that everything is set up correctly. At the Windows Command prompt make sure you have activated the virtualenv. print (type(a)) # Prints "<type 'numpy.ndarray'>"
print (a.shape) # Prints "(3,)"
print (a, a, a) # Prints "1 2 3"
print (a) # Prints "[5, 2, 3]"
print (b.shape) # Prints "(2, 3)"
print (b[0, 0], b[0, 1], b[1, 0]) # Prints "1 2 4"
If the output matches the comment numpy works correctly.